Those words, perhaps the most chilling from “Long Black Veil,” one of the most haunting murder ballads you’ll ever hear, have been sung by a whole lot of folks over the years, including iconic voices like Burl Ives, Jerry Garcia, Rick Danko and Levon Helm of The Band, Joan Baez, Mick Jagger, and Dave Matthews on record, not to mention the umpteen others who have taken a crack at it onstage. But when Johnny Cash sang anything, it immediately became his own. With “Long Black Veil,” he locked onto a song that encapsulated many of the themes that were represented in his work: The way that passion can override judgment, the pressure to live up to a code even if it means personal hardship, and the way extreme situations in songs can be made relatable by imbuing them with honesty, integrity, and, of course, a voice that no one could ever possibly replicate. Dill took his unfinished song to co-writer Marijohn Wilkin to hammer out the plot. What they came up with was a tale that transcended all of its disparate sources. “Long Black Veil” tells of a man killed in front of witnesses “‘neath the town hall light.” The witnesses identify a man who looks like the narrator fleeing the scene. When the judge asks for an alibi, the narrator offers none because revealing it would bring to light the fact that he had been sleeping with his best friend’s wife. The ironic thing is that Dill had envisioned a folk song, yet “Long Black Veil” was brought to the charts by country star Lefty Frizzell. Cash first recorded the song back in 1965 on the album Orange Blossom Special, which was notable for the inclusion of several Bob Dylan covers. 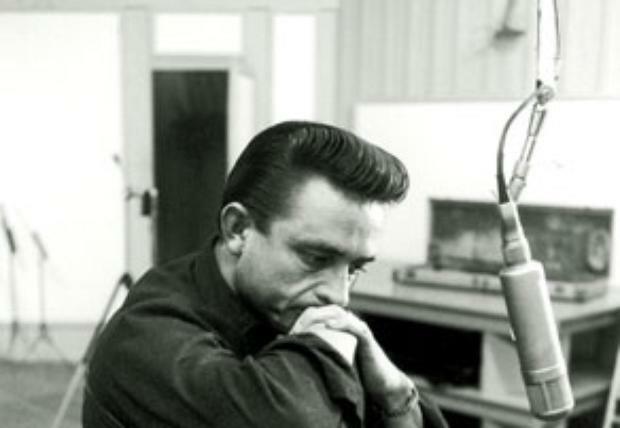 On this initial studio recording, Cash is accompanied by his usual boom-chicka-boom rhythm and some angelic female vocals in the chorus. Yet perhaps his most iconic performance of the song came on his landmark Johnny Cash at Folsom Prison album in 1968, which was a huge comeback for The Man in Black after drug dependency had impeded his momentum in the mid-60’s. Closing out Side 1 of the LP, “The Long Black Veil,” (the “The” has been periodically appended to the title throughout the years) certainly resonated with the audience of prisoners, some of whom likely understood the nature of crimes of passion and the consequences that accompany them. In fact, maybe it resonated with them too well. Cash treats the song with the utmost seriousness in that landmark concert, at least until a few members of the audience cheer at the line, “I had been in the arms of my best friend’s wife.” Johnny cracks up at that moment, halting the song momentarily as the crowd cheered wildly. It was a telling moment of solidarity between the prisoners and a music legend who empathized with their struggle. In 1969, The Johnny Cash Show began on ABC. It’s well-known that the first episode of the music-filled hour featured Dylan performing Nashville Skyline material. Another performer on that inaugural show was Joni Mitchell, who, at the time, was still mostly known for the songs of hers that had been covered by others. The show gave her a network TV spot just as her career was starting to blow up big, and she sang a duet with Cash on “Long Black Veil.” When the two voices, which couldn’t have been more different, came together to form some unexpectedly haunting harmonies, it was a fantastic moment. “Long Black Veil” would stay in Cash’s live repertoire for many years. He clearly loved it; it was one of 100 essential country songs he deemed as essential in a list he presented to his daughter Rosanne in 1973. She would eventually release a solo album in 2009 called The List which would include a performance of “Long Black Veil,” featuring Jeff Tweedy of Wilco, which her father would have loved. There is no doubt that “Long Black Veil” is an amazing song. Yet it’s also one that can easily veer into melodrama in the wrong interpretive hands. Think about the erratic behavior of the main character. He abandons his better judgment to his overpowering desire, yet, when put to the test, he sacrifices himself rather than destroy the lives of his best friend and his true love. In other words, the singer has to convince the audience that he both can screw up and do the wrong thing and then man up and do the right thing. Considering that, it’s quite obvious why Johnny Cash is the towering standard against whom all other singers of “Long Black Veil” will forever be judged.